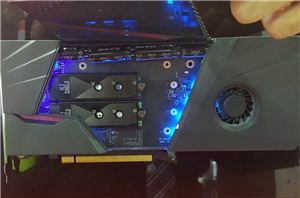 Our most popular news during the week of Computex was, without a doubt, AMD’s announcement of the next generation of Threadripper. 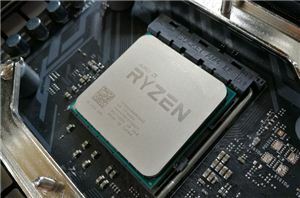 The new chips, coined Threadripper 2, are set to have up to 32 cores on board and be socket compatible with current X399 motherboards. However, the new chips will be rated at a 250W TDP, which as a result might be limiting to some of the current motherboards on the market. While all of the new CPUs will work in all of the current X399 motherboards, overclocking may be limited. 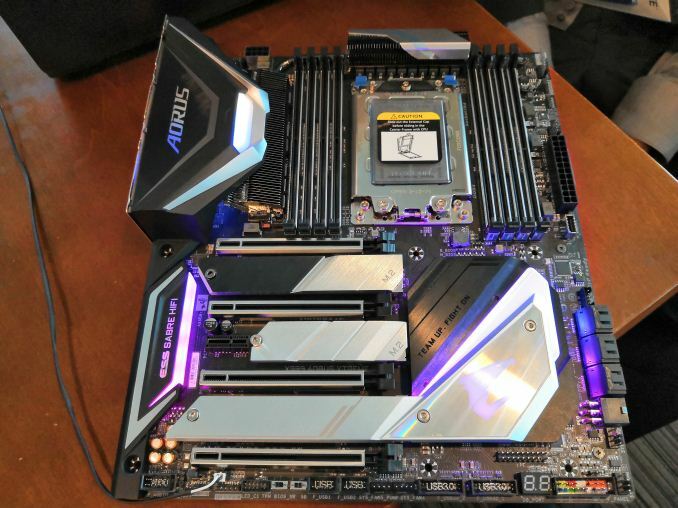 As a result, some manufacturers are working on an X399 motherboard refresh, and GIGABYTE is stepping up with its new top-end halo motherboard, the X399 Aorus. Aside from all the metallic looking pieces, GIGABYTE’s new motherboard is taking cues from its return to a more traditional finned heatsink design for the power delivery. The new 13 phase motherboard (10+3) is using a connected direct-contact heatpipe between the two main heatsinks to afford a better cooling scenario. Beyond this the motherboard has DRAM and PCIe slot protection, and a massive chipset heatsink area that also supports heatsink cooling for three M.2 SSDs. GIGABYTE went into a bit more detail on its heatsink cooling. The main finned heatsink is copper, not aluminium, for better cooling performance. The company is also using higher-grade thermal pads in the VRM region, rated at 4-5 watts per kelvin, rather than a standard 1.8 W/K as seen on most other motherboards. The exact rating is still TBD as the engineers/bean counters determine which is best, however GIGABYTE expects a better thermal response here and says it will be crucial for the new CPUs. 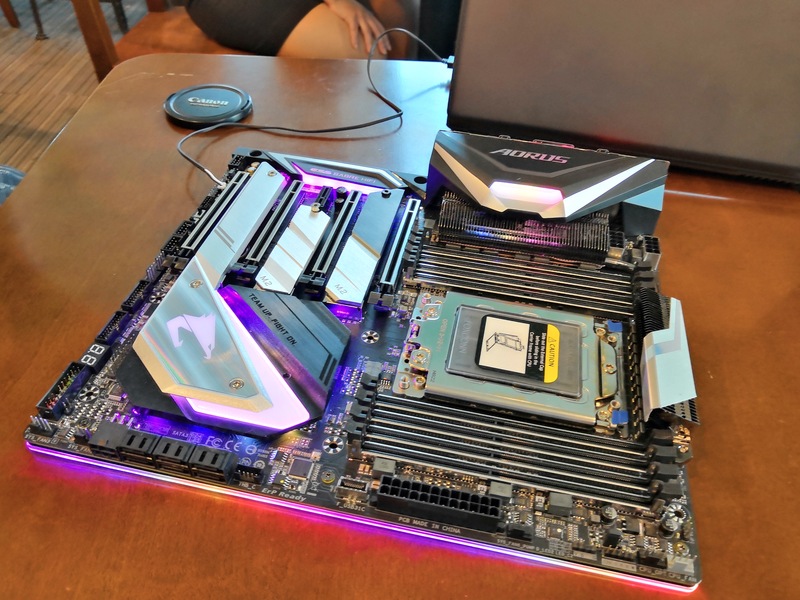 One of the elements to this motherboard that GIGABYTE explained to us was the move away from garish LED PCIe and DRAM slots and the like, instead going for a cleaner and premium look that befits a workstation motherboard. Instead the LEDs are limited to the Aorus related logos and underneath the motherboard in order to give it a subtle glow. 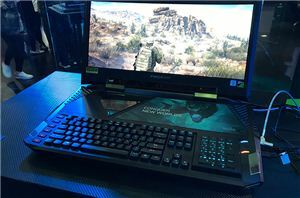 For features, GIGABYTE has equipped the motherboard with a 10 gigabit Ethernet port, using Aquantia’s AQC107 controller, as well as two Intel I210-AT single gigabit ports. This motherboard will also be one of the few X399 motherboards with Wi-Fi, using Intel’s AC-9265 802.11ac Wave 2 solution. Audio comes through an ESS 9118 Sabre DAC, which on paper is rated up to 125 dB, although electrical configuration will put it just below that (final numbers TBD). A front-panel Type-C header powered by an ASMedia ASM1143 chip is also in the mix. The exact release date and pricing is TBD, however GIGABYTE expects it to be ready for the launch of Threadripper 2 later in Q3, if not before. Link Aggregation is still a thing, thought a single port is better, ie single 2gbps port is better than 2x 1gbps ports, thought there's no single 2gbps standard, the new one is 2.5, 5 & 10gbps. I'm ignorant on this subject, but how is the DAC better than the on-board hardware? You mentioned drivers but that's never been an issue in my experience. Mind you I mostly run linux except for 1 desktop machine which remains windows mostly because of Photoshop. I really don't game much anymore though that used to be a reason in the past. Cracking and popping noise; high background noise, hissing. Driver problems like some features in Windows sound do not work or stop working unexpectedly or audio apps crash. Did I forgot to mention bloatware coming with the drivers? Or autodetection of ports that thinks a line-in is a headset? My stereo DAC uses simple Microsoft drivers, no fancy 3D processing, no effects, no fuss; never had a problem with that.